The original publication of the culmination of Bulgakov's life's work, in the journal Moskva in 1966/7, was a rare, fresh breeze of freedom blowing through Soviet spiritual and artistic values. The courage of its themes (Jesus Christ, Pontius Pilate, Satan and The Great Terror of the 1930s), and it's style (a combination of satire, clowning and intense honesty), combine in this devastating satire of Soviet life in general, and Soviet literary life in particular, to stun its readers. The multi-layered plot pivots on a dialogue between the people's poet and critic on the best way to portray Christ as an exploiter of the proletariat. Interrupted by a stranger (Satan in the guise of Woland), they unknowingly allow him and his chaos-bringing retinue of vampires, witches and even a giant cat, into their world. 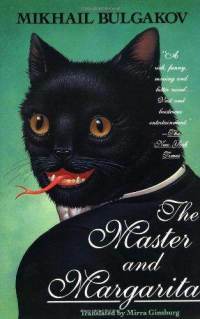 For the modern reader, even without the historical and political context that saw Bulgakov's work banned by Stalin, this is hugely enjoyable work of genius, terrifyingly brilliant, but at the same time darkly disturbing. Mikhail Afanas'evich Bulgakov was born in Kiev, the current capital of Ukraine, in 1891. His father, Afanasii Ivanovich Bulgakov, was a respected academic at the Kiev Ecclesiastical Academy, and died in 1907, when Mikhail was 16. He married his first wife, Tatyana Lappa, in 1913, and graduated from Kiev University's Medical School in 1916. Once he had graduated they moved to the provinces, where Bulgakov began his practice of medicine in the villages, which he later documented in his early works Notes on Cuffs (1923) and A Country Doctor's Notebook (1925). In 1918 Bulgakov returned to Kiev, where he set up a private practice before enlisting in the anti-Bolshevik White Army as a field doctor. He was sent to the Caucasus where, in 1919, he left the army and decided to quit medicine in order to focus on writing and journalism. In 1921, he and Tatiana moved to Moscow, where he began to experience some success as a writer. His success was limited, however, due to his anti-Soviet tendencies. Over the next couple of years he continued to have his novels published, but they drew fierce criticism from the Soviet press of the time. Heart of a Dog and Fatal Eggs, two of his most well-known works other than The Master and Margarita, were published in 1925. By the end of 1926, however, his prose career was effectively over due to censorship, with his next book not published for a decade -- and that only a middling autobiography of Moliere. He began writing what was to posthumously become his most famous novel, The Master and Margarita, in 1928, but never attempted to have it published, hiding it in his desk drawer and once even rewriting it from memory after burning a draft. Instead, Bulgakov focused more on his theatrical writing - his Cabal of the Hypocrites of 1929, a dramatization of the life of Moliere, is still performed by the Moscow Art Theatre today (though at the time it was canceled after seven performances). Yet by the end of 1929 this avenue was effectively closed to him as well, thanks to his frequent satirization of the Soviet regime, and in desperation in 1930 he wrote to the government requesting permission to emigrate - his brothers had already fled to Paris with the White Army during the revolution. Stalin personally called him back, and as a favor to the author of Days of the Turbins, found Bulgakov work, first in a small Moscow theatre, and then in the Moscow Art Theatre. However, the writing he did for them was never performed, and he wished to see his siblings again, so he wrote to the authorities repeating his request several more times during the 1930s, but all his letters went unanswered. In 1931 Bulgakov was married for a third time to Yelena Shilovskaya, who became his inspiration for the character of Margarita in The Master and Margarita. He continued writing plays, stories, critical works, and translating during the last decade of his life, as well as working on The Master and Margarita, but had nothing published during this time, with the performances of several of his plays and theatrical adaptations canceled at the last minute. Bulgakov died on March 10, 1940 of the same kidney disorder, nephrosclerosis, that his father suffered from, and was subsequently buried in Moscow. I love Master and the Margarita. It's such a fascinating and unique book. Behemoth is my favorite character!